As a little girl growing up in Trinidad, I and children of my generation were fortunate to read the legendary Ladybird Sunstart and Boyo and Carla basal readers throughout our primary school years. In these books, independent, intelligent, intrepid and well-loved Caribbean girls who looked and lived like me went on adventures, solved mysteries, played sports, learned valuable lessons, and were accepted and supported by their loved ones or community. Partly because of those stories, I grew up taking for granted that it was perfectly normal for a girl to be clever, confident, strong willed, and also kind and generous. 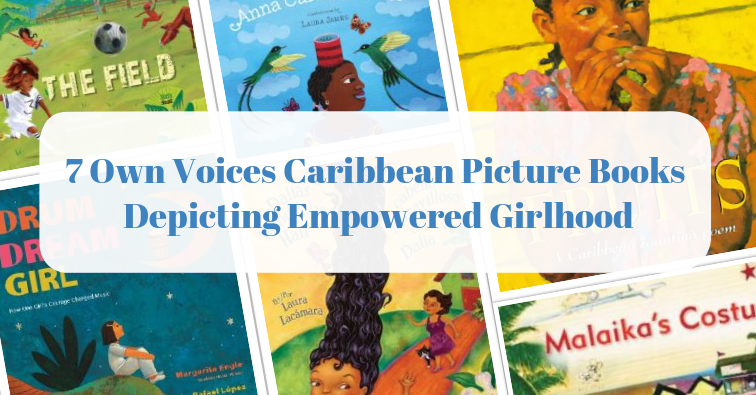 Books that portray Caribbean girls of all races in the full range of their being offer all children much-need inspiration and the opportunity to see that gender stereotypes don’t apply to everyone. Girl characters in children’s literature don’t have to be perfect; in fact, flawed characters do a much better job of helping young readers connect to stories and navigate difficult issues in their own lives. Misogyny is as present in the Caribbean as anywhere else, so when it comes to picking Caribbean books for your child, it’s important that the female characters have agency and identities of their own. Here are 7 books to get you started. This is the compelling true story of Millo Castro Zaldarriaga, the real-life Chinese-African-Cuban girl who flouted convention to become Cuba’s first female professional drummer. 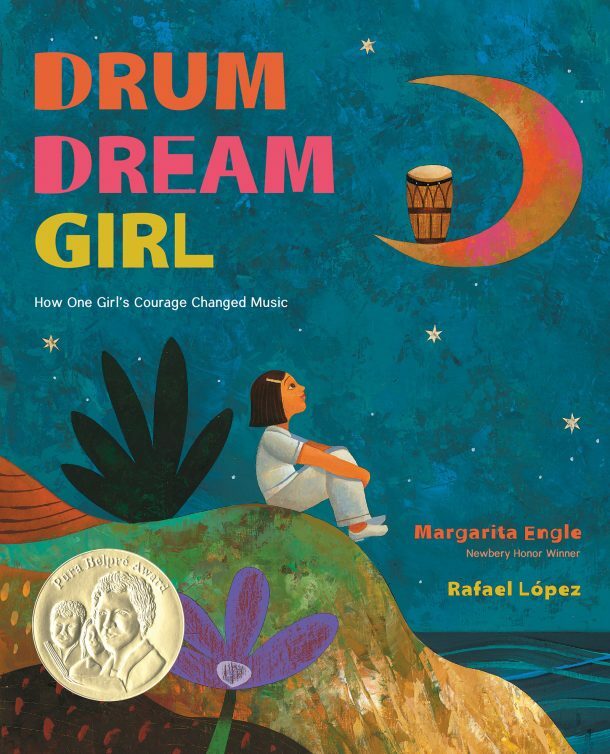 At a time in Cuban history (the 1930s) when only males are allowed to play drums in the popular dance bands of the day, young Milo, enraptured by the pulsing rhythms of her musical island, secretly nurses her heartfelt dream of becoming a drummer. Everyone, including her father, keeps reminding her of the female taboo, so she relies on her own inner resolve, practicing the instrument intently on her own until her talent can no longer be denied. Young readers will be inspired by this courageous and unconventional pioneer whose self-determination, tenacity and discipline not only opened doors to success, but also changed restrictive societal mindsets. Although the book focuses only on Zaldarriaga’s formative years and does not follow the full trajectory of career, the end note explains that she and her sisters formed a successful band, called Anacaona, that redefined the hitherto male-dominated son music scene, and today maintains its legendary status as Cuba’s world-famous, first all-female orchestra. With luminous, whimsical acrylic illustrations, this lyrical story celebrates and affirms the power and magic of giving girls equal opportunity to follow their dreams. 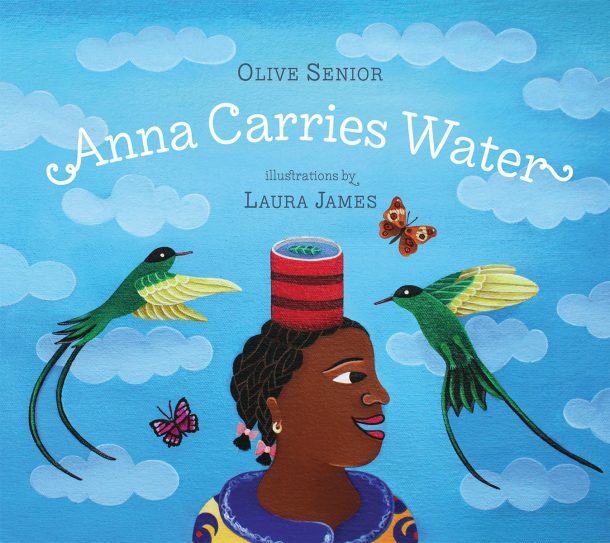 Set in the Jamaican countryside, this is the heartwarming story of Anna, a relatable little girl who desperately longs to be able to fetch water from the spring the way her older siblings do — by balancing it in a container on her head. Mastering this new skill isn’t the only challenge; she also has to overcome her fear of the perfectly harmless cows pastured in Mr. Johnson’s field near the spring. Despite her clumsy failed attempts, Anna persists, determined to learn how to head-load; carrying water may not be easy, but she’s no wishy-washy flip-flopper! Her older siblings sometimes grow impatient with her, but are generally encouraging of their ambitious baby sister. The perceptive Anna clearly understands the importance of water as she observes all the ways it is used around the home, which seems to drive her objective even more. When she eventually accomplishes her goal in a surprising and somewhat humorous conclusion, she discovers that she no longer feels cowed (pun intended) by anything. The bold and vibrant acrylic illustrations do perfect justice to this story of a young girl coming into her own joyful sense of self-confidence. Drawing from the author’s girlhood in Puerto Rico, this upbeat bilingual book follows a Puerto Rican girl through a routine school day as she interacts with family and friends. 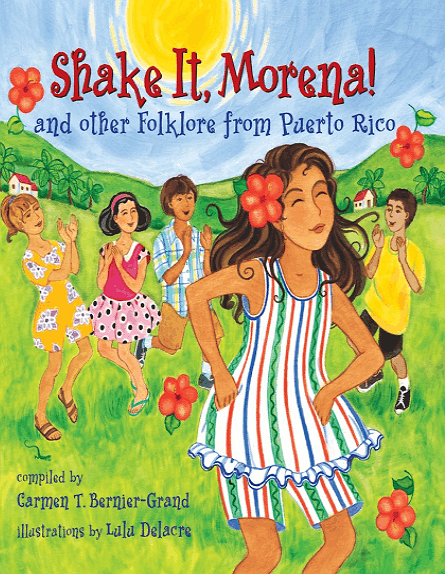 The book does not have a standard narrative; instead, the familiar sounds, sights and customs of the island come alive through a selection of traditional Puerto Rican folktales, songs, riddles and games, each one corresponding to a different aspect of the young girl’s school and family life. At home in her own skin, a hibiscus flower perched jauntily in her hair, the spirited protagonist oozes the natural self-confidence and infectious joy that so many girls, sadly, often lose as they approach adolescence. The book does not have an explicit feminist message but, at a time when countless girls around the world are still denied an education, and Puerto Rican children are going back to school after the devastation of Hurricane Maria, readers will get a sense of how the privilege of an education grounds, inspires and uplifts a young girl. The vibrant watercolor illustrations solidify the overall impression of happy, liberated girlhood, a right that all girls should have. Although the book’s title might suggest a superficial focus on outward appearances, this whimsical and somewhat offbeat story set in Cuba actually presents the message that embracing one’s quirkiness is the key to blossoming in life and making a positive mark on the world. 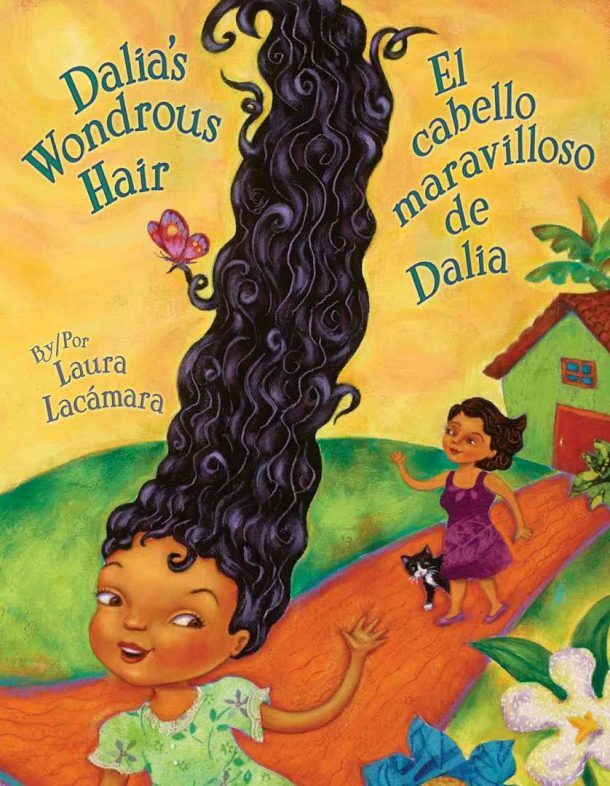 Dalia, the free spirited protagonist, is an oddity in the village with her Rapunzelian hair and her fanciful imagination. A true flower child, she sees nothing wrong with pretending she’s a tree, running barefoot through the forest and the marsh, and getting dirty in the process, all to the dismay of her wet blanket, chore-weary neighbours. Her mother, however, accepts and supports her nonconformist wild child even as Dalia festoons her magically growing hair with more and more items collected from nature — flowers, leaves, mud, even caterpillars. In the end, her hair becomes a cocoon and yields a wonderful surprise that lifts everyone’s spirits and brings the neighbors together. With its vibrant mixed-media illustrations, this story offers much-needed affirmation to all the “weird” girls out there who feel like they don’t fit in. 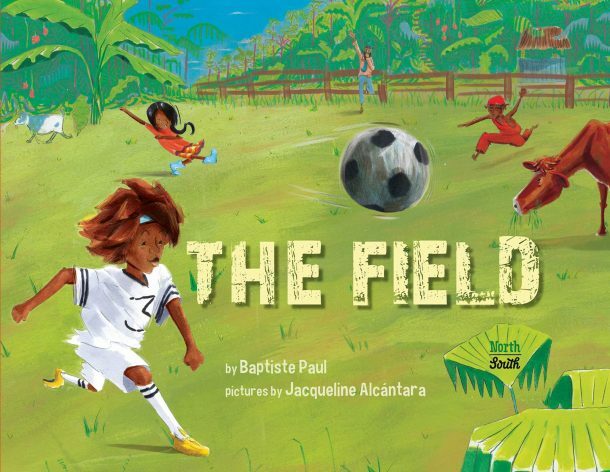 Set in the countryside in Grenada, this story follows a take-charge, sporty girl as she and her younger brother gather the village children for a game of association football and proceed to enjoy the rough-and-tumble match. Clearly the ringleader and the star player, she revels in her wildness and wiry strength and isn’t afraid to get more than a little dirty; not even a tropical downpour can stop her from showing off her moves! Dressed in full kit, she takes her sport seriously and is a fierce competitor, but also has loads of fun. The colorful, action-packed illustrations implicitly celebrate a Caribbean girl’s ability to move freely through the world and pursue her passion, as she juggles, tackles and dribbles her way across forest and field. It is refreshing — and true to life — to see a black Caribbean girl in children’s literature being so utterly herself and so at home in the outdoors. The spare English text is interspersed with Grenadian French Creole words. A rhyming counting poem at first glance, this is also a story of sisterhood. Two sisters with an unabashed fondness for the various tropical fruit growing on their island plot and scheme their way into cupboards, climb trees, outwit adults, and in short, do anything necessary to get their hands on nature’s perfect snacks. The girls don’t merely pick fruit; they also reap a sweet harvest of joy, camaraderie and childlike mischief as they relish the feast of carefree girlhood. Although it is not explicitly stated, fruit-picking in the outdoors without adult supervision is not merely a recreational activity, but also an expression of freedom and independence for the girls. Whenever their fruit-snatching missions threaten to go pear-shaped or cause sour grapes between them, they find ways to work together and overcome their differences. Flawed and likeable, these sisters must pay the consequence for their gluttonous moments, a necessary growing pain. Their appetite for fruit reflects their youthful appetite for life, as their sisterly relationship ripens into an unbreakable bond. Textured oil paintings in rich, fruity colours bring the rural Caribbean setting to life. 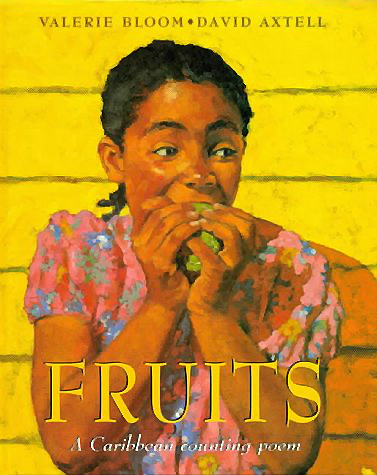 The Jamaican Creole text sparkles with authenticity, and many Caribbean readers will relate to this homage to fruit-picking, one of the familiar rites of Caribbean childhood. Malaika misses and constantly writes to her mother, who has migrated to Canada in hopes of making a better life for her daughter. 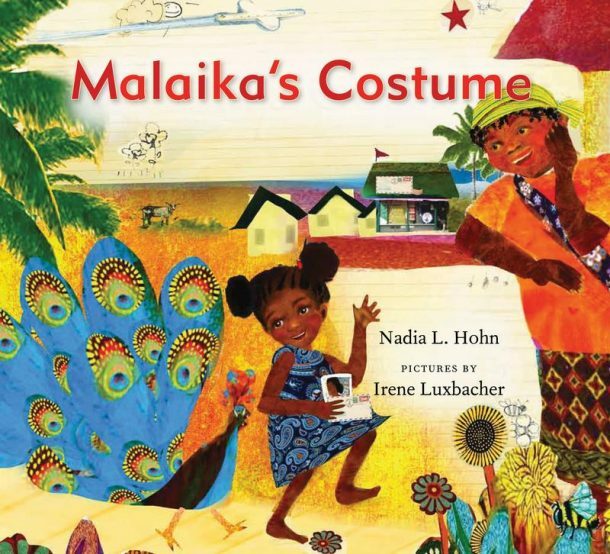 Malaika’s dream of participating in the Kiddie Carnival threatens to fall apart when her mother is unable to send the money for a new masquerade costume. Despondent at first, she impertinently refuses the old well-worn costume that belonged to her grandmother when she was a little girl, but soon experiences a change of heart. Set in an unnamed Caribbean island, the story follows the spunky and resourceful Malaika as she maintains her dignity in meager circumstances, and learns to see herself as proud, beautiful, strong and deserving of life’s goodness and bounty. The vivid mixed-media illustrations convey a sense of Malaika’s bright and positive outlook. Summer Edward is one of the guest speakers for CET’s Writing for Young Readers online course on the Coursera platform and editor-in-chief of Anansesem, an online magazine devoted to Caribbean children’s and young adult literature.